So over here at Casa H we've been working on redecorating the master bedroom and bathroom. 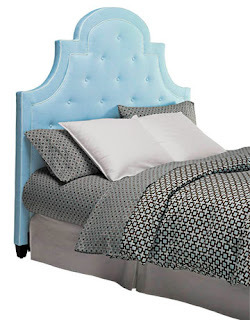 I am dying for an upholstered headboard. I am I.love.with.them. I am however not in love with their price tags so, Gasp, I'm going to attempt to make my own! One for my room and one for my guest room. or how about this one with the nail head trim ? It's so classic. How fun is this striped one?!?! or this bright blue one? or another fun colorful one! If only I liked bright colors! So bffs which one do you like best? or a fun color or pattern? 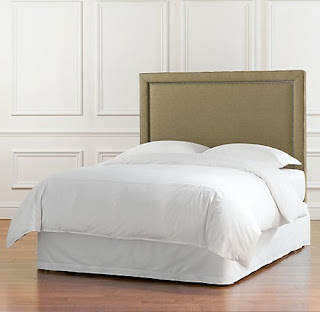 Our queen bed has a khaki colored tufted upholstered bed in a romantical shape. I adore it!!! But, the new "big bed" is a wooden sleigh bed. 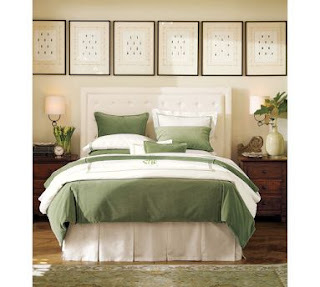 I love the simple khaki or white, it will stay timeless long after you get sick to death of your bedding! Oooh, they're all so cute! I really like the second one; the whole room is so romantic looking and I adore the shape of the headboard. The square ones are great too, although i like them with tufting or nailhead decorations. Hope your project goes well! I love them all. I want to be fun and funky but love the classic look of the 2nd one with that lovely shape. So cool that you will make your own! DIY tutorial please! I think for the master I'd stick with a neutral so I could switch up the linens if I wanted. For the guest room, I love the stripes! Fun, but not too busy. They really are so charming though! Good luck making your own -- I'm looking forward to seeing how they turn out. 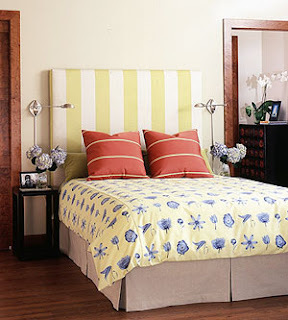 I love the idea of a funky bright headboard, but I could never pull it off. I'm more of a neutrals kind of girl. Maybe you could find a neutral fabric with a pretty (yet subtle) pattern in it, just to make it a little more fancy? The last one, but I'm afraid I'd get sick of it! Ohh I really like these! I'd probably go with a solid color but that's just me because I like to change up my bedding so often. SO impressed. show us a step by step! #3!!!! Looooove them! Can't wait to see the finished product! 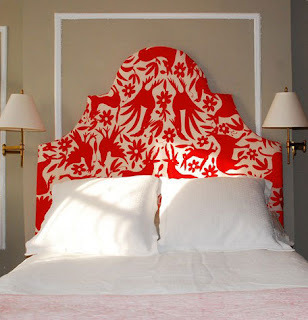 I LOVE these headboards. I'm currently trying to find one, or find one that looks simple enough to make. I like ones with patterns! But I guess that tends to work best when you have a really plain comforter. I also really love that first one a LOT. 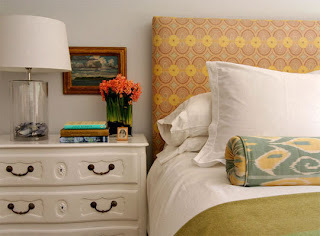 i am so wanting an upholstered headboard!